It’s hard to believe that I have already been at Banting House NHSC for four months! The Fall Term seemed to fly by. I’ve learned a lot so far from Grant, the museum curator, and the Canadian Diabetes Association staff who work at Banting House, along with all of the amazing volunteers. I’ve had the opportunity to be involved in a number of different projects and develop a wide range of skills. Before starting my Research Assistantship at Banting House, I had never really experienced what it was like to work in a small museum or appreciated how much effort went into running an event. Helping with the World Diabetes Day celebrations showed me that there’s a lot more to event planning than participating on the day of. Between organizing activities, asking for volunteers, ordering food, and setting up for the event, I couldn’t believe all of the details that went into the day. I’m glad that we did put in the effort because it turned out to be a great day, even if the weather didn’t cooperate for us. Another thing that I’ve been able to try my hand at is working with the collections management system PastPerfect. This has given me the chance to not only learn about cataloging museum objects, but also to explore some of the newer acquisitions to the collection such as photographs of Dr. Banting and Dr. from the 1930s. Using PastPerfect also helps to create a record for Banting House of all of the artifacts in the collection, and holds the information in one place so that it’s easier to find an object’s description or location. I’ve also enjoyed giving tours to the visitors that stop by Banting House NHSC. Leading tours has allowed me to engage with the museum galleries and the stories that they hold. It’s always fascinating to hear people’s experiences with diabetes or how they relate to Dr. Banting, whether they know very little about the topic or have lived with the disease for a number of years. Interpretation is a great way to share the message of Banting House, but it also gives the tour guide a great chance to learn more themselves. I’ve probably learned just as much from our visitors as they have from me. One of the last projects I’ve been working on is preparing an Emergency Preparedness and Response Plan for Banting House NHSC. It will be used to help prevent any potential damage to the building or collection, as well as provide a plan of action if something was to happen (such as the basement flooding). While it may not seem like the most interesting thing I’ve been doing this term, it’s an important to have a plan in place so that if there ever was an emergency, we would know how to deal with it right away. Overall, I’ve had a great experience as an RA at Banting House NHSC so far. I can’t wait to see what’s in store for next term, but for now I hope that everyone has a safe and happy holiday! 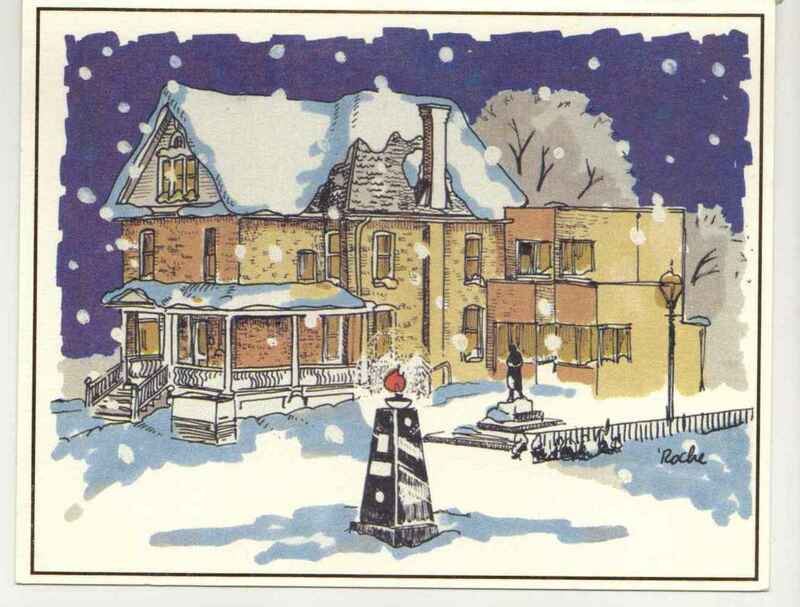 An artist’s rendering of Banting House National Historic Site, the image on our Modern Holiday Card.